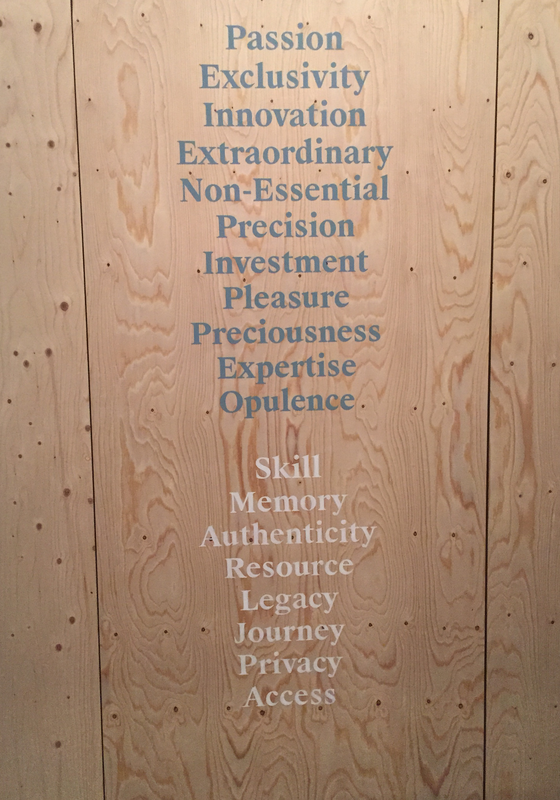 The following is a reflection of the “What is Luxury?” exhibit at the Victoria & Albert Museum in London. Like almost everything, luxury is subjective. A fur coat is luxurious to someone in a temperate climate, yes, but is a fur coat really a luxury to someone in Siberia? Is it considered a luxury to not die of hypothermia or frostbite? Where do we draw the line? While I shamelessly refer to myself as a spoiled JAP (Jewish-American Princess) from time to time, I like to think that I’m decently well-adjusted. I am well aware of the fact that I grew up fortunately, and I’m eternally grateful for the life my parents have busted their butts to give me. That said, in only my most “spoiled brat” moments, I have been known to forget that certain things in my life are serious luxuries because I have become so accustomed to them. My phone dying, for one. Let me preface this next bit by saying that I am the kind of person that is glued to their phone. Do not blame my age for this, baby boomers. I have plenty of friends who aren’t nearly as dependent on their phones as I am, and don’t have a panic attack when they die (the phones, not the friends). I digress — I am slightly ashamed to admit that I do, in fact, have a problem with my attachment to technology, so much so that I forget that it isn’t really that big of a deal if I can’t check Instagram for an hour. I have gotten better over time, but my phone died during a concert that I went to a week ago and I’m still bummed that I couldn’t get pictures of it even though I thoroughly enjoyed the show and it doesn’t actually matter to anyone that I wasn’t able to document it. That is what I mean when I say I forget that certain things are luxuries. I wouldn’t ACTUALLY die without my phone. I would probably get lost trying to get from one end of London to the other without its help, but who doesn’t love forced social interaction? Luxury is also subjective in relation to time, and sometimes a thing that was once considered luxurious can become a necessity. I can complain now when my little pocket computer dies and I’m forced to talk to the people around me, but twenty years ago, my then-pregnant mom got a flat tire on the highway with no phone to call my dad and she had to depend on the total stranger that pulled over to help her. Today, not only do most of us have phones in our hands or attached to our butts at all times, we also have wall chargers, and portable chargers, and car chargers. In 2015, a pregnant woman getting a flat tire on the highway is so unlikely to not be able to get help because of the rapid development of technology that we can easily argue that phones have become a necessity rather than the luxury they were once considered to be. < leaving home/getting settled/the first two weeks. Hi Gabby! I completely agree that our society is a bit to dependent on our phones. It’s definitely something I need to work on myself. It really shouldn’t be that big of a deal that our phones dies and we have to talk to people, but that’s just how we are now. I completely agree that luxury is relative. I would never have considered Skippy Peanut Butter luxurious, but since I have been in London, it is something I cannot stop thinking about! I enjoyed your post, keep up the good work!